Blytheville, AR for the night. 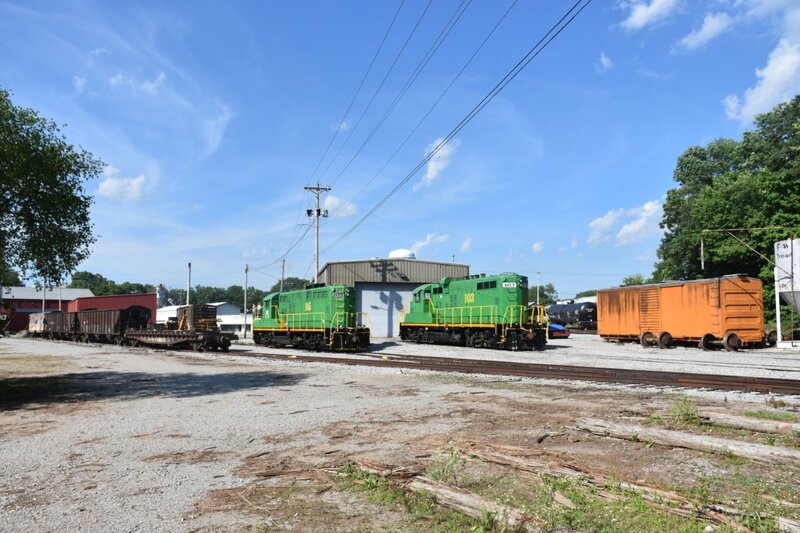 shops, caught the in-bound train from Lawrenceburg with 3 ex ATSF GP-9's. Speeders to East Stroudsburg and beyond! On June 19th the Mid-Atlantic Motorcar Association ran a 'speeder' trip from Scranton to Point of Gap. In talking with one of the speeders owner, I was told there was thirty-one speeders signed up for this trip. According to the Association's description of this trip's route, it was described this way "... as we must leave by 8:00AM. We will head east on the D&L through beautiful countryside, along the river, through at least one tunnel, past many restored stations through places with names like Tobyhanna, Gouldsboro, Moscow as we head for the Delaware Water Gap. We will make a lunch stop at Stroudsburg, and have been told that the Stroudsburg Tower will be opened for us. We will make our turn at Point of Gap, and return again through the breathtaking Pennsylvania countryside traveling the route of the "Phoebe Snow". Truly a great day on the rails that awaits us!" Photo 1: Shows some of the speeders passing through the Analomink Street grade crossing in East Stroudsburg. Here they will stop for lunch and have a 1:45 departure time for the next leg of their trip to Point of Gap where the speeders will be turned. Photo 2: One of the speeders showing the interior. This one had the markings of being a former CN Rail speeder. Photo 3: Departing from East Stroudsburg, some of the speeders are seen passing beneath the I-80 overpass while others are approaching the Forge Road grade crossing. playing peek-a-boo at the loader and others buried deep in the compound. the night. to be continued. 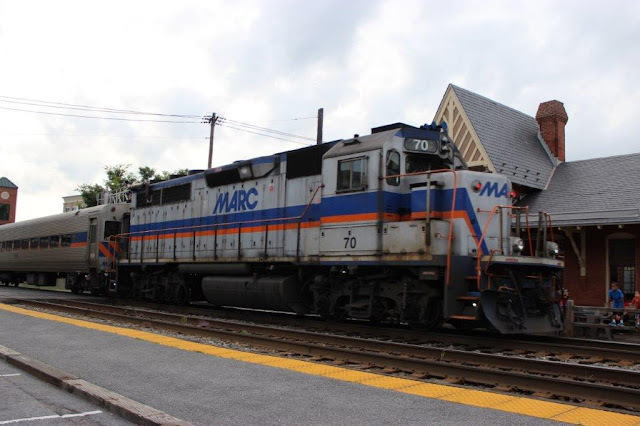 caught a photo of Marc r/n 70, not the usual locomotive expected, on a train at Gaithersburg, MD. JACKSONVILLE, Fla., (June 16, 2016) – CSX Corporation (Nasdaq: CSX) will release second-quarter financial and operating results on Wednesday, July 13, 2016, after the market close. The company will host an earnings conference call from 8:30 a.m. to 9:30 a.m. Eastern Time on Thursday, July 14, 2016 via teleconference and a live audio webcast. 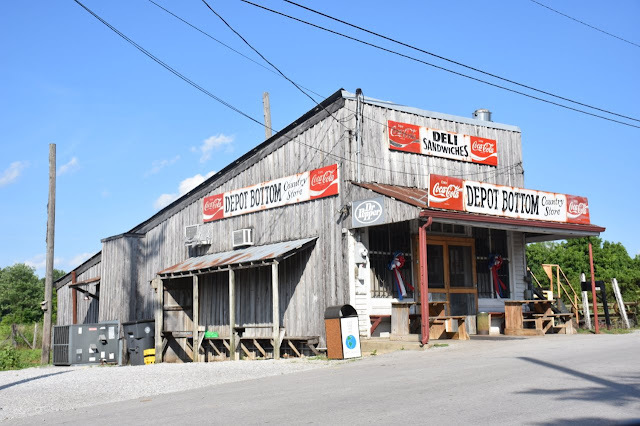 Presentation materials and access to the audio webcast will be available on the company’s website athttp://investors.csx.com. Following the earnings call, a webcast replay and an MP3 audio file will be archived on the company’s website. Orange Juice on the Lehigh Line! 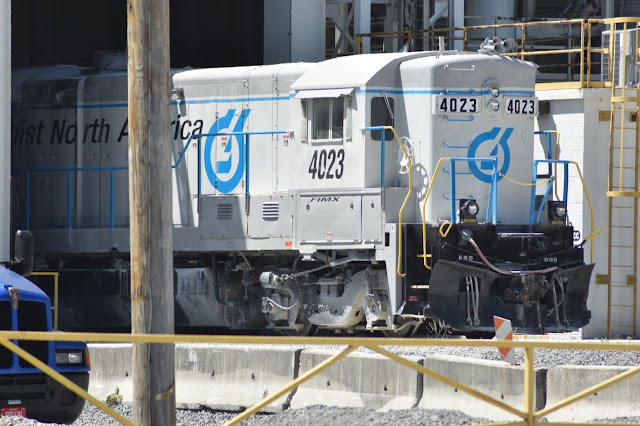 Due to Monday's derailment of CSX's Q373, a Philadelphia to Cumberland (MD) general merchandise train, in Baltimore's Howard Street Tunnel. It was reported that ten of Q373's 124 cars derailed in the tunnel. That resulted in some CSX trains being re-routed over NS's Lehigh Line. One such train was Tropicano's "Juice Train" seen here approaching the Kiceniuk Road grade crossing just west of Stanton Station around 6:12 on Tuesday. Definitely a different sight from what one normally sees traveling this line. 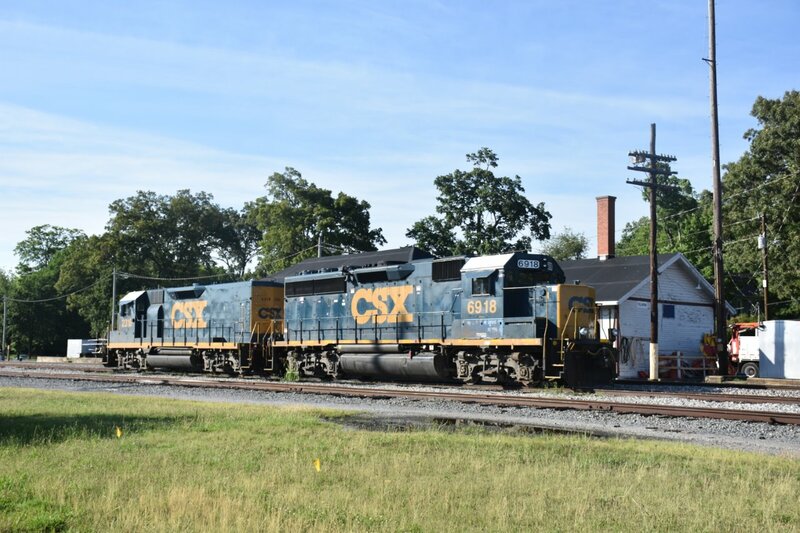 CSX’s Q034-13 is eastbound at Lehigh Line MP 68.8 in Bloomsbury (NJ) on June 15, 2016 at 8:35 AM. Motive power for this Jacksonville, FL to North Bergen, NJ intermodal was CSX 428 (AC44CW) and CSX 743 (ES44AC-H). CSX’s “Juice Train” also was re-routed over the Lehigh Line. These re-routes was the result of CSX’s Q373 derailment of thirteen cars of a 124 car Philadelphia (PA) to Cumberland (MD) freight train inside Baltimore’s (MD) Howard Street Tunnel at 5:45 AM on June 13.
was part of the consist on NS 18G as it passed through Hillsborough (NJ) at 8:47 on June 10. NS's Safety Train provides training for emergency responders in eighteen states to help communities across the NS network prepare for and safely respond to potential incidents involving rail transport of hazardous materials. These classes will be held at NS's Oak Island facility on June 14 through June 16. Seen here is NS 5642 (GP38-2), one of the three tank cars used in this educational program and one of the two boxcars that serves as a classroom for participants. NORFOLK, Va., June 8, 2016 – Norfolk Southern Corp. (NYSE: NSC) Executive Vice President and Chief Financial Officer Marta Stewart will make a presentation at the Citi 2016 Industrials Conference. JACKSONVILLE, Fla. – June 8, 2016 – Frank Lonegro, CSX Corporation (Nasdaq: CSX) executive vice president and chief financial officer, will address the Citi 2016 Industrials conference in Boston on Wednesday, June 15, at 8:00 a.m. Eastern time. This announcement, as well as additional financial information, is available on the company’s website athttp://investors.csx.com. NYSME will be hosting rail historian Victor Zolinsky as he comes to speak about rail operations in the Northeast. Victor will be showing slides of the New Haven, Boston and Albany, New York Central and other lines from New England. All photos were taken by Victor who started shooting photos in his youth in the 1940s. He continued his photography while actually working on the railroad. Victor would be hired on as a towerman on the New Haven and worked his way up to trainmaster, working at Grand Central Terminal. This is the third time that Victor has come to present. All are astonished by the wealth of information that Victor is! Vic's encyclopedic knowledge of railroads and their operations make it quite a learning experience for all those who are in attendance. This Photo Freight will feature the BR&W #60, NJ’s oldest operating steam locomotive! The train will be made up of passenger equipment, freight cars & a caboose. The day's last scheduled train will head from Flemington to Three Bridges. We'll follow this train & be given the chance to take some very rare photos of #60 & the train. 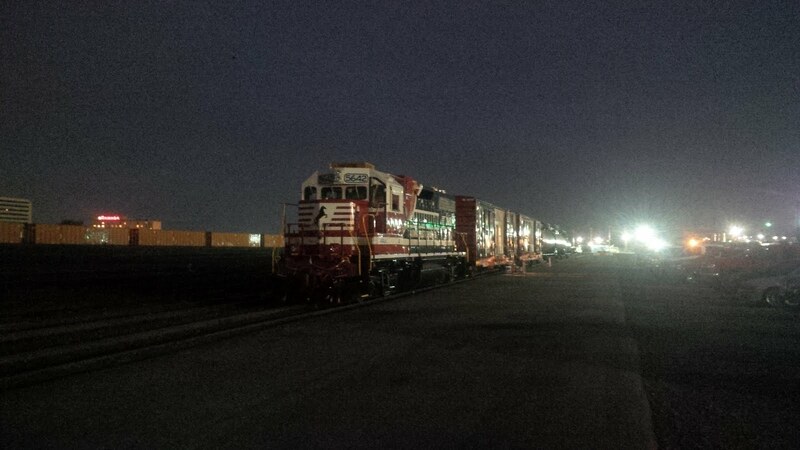 After the train returns to Flemington we'll board for a trip to the end of in service track at Boss Road. All day the train will stop several times for photo run-bys. An extra fee Night Photo session will be held in Ringoes. A variety of scenes will be set up featuring the #60. The night photo session tickets are limited to only 30 people. 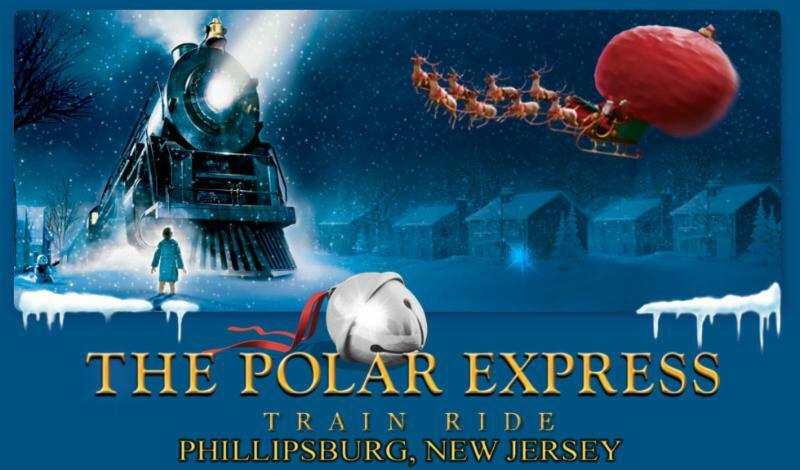 You can choose to ride in coach for $40, Club Car for $60 or in the Caboose for $50. A Night Photo 'combo' ticket is $55 for coach, $65 for Caboose & $75 for Club Car. Our first Storytime Express of 2016 will be this Saturday June 4, departing Ringoes Station at 10:45 AM! Tickets are now available - visit our website for details and tickets! 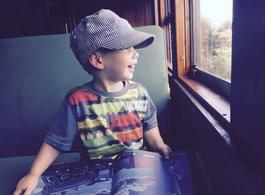 This train features a magic act, singing, story-telling, and the kids get a book to take home! Geared towards our younger pre-school aged guests, this train is the perfect way to introduce them to BR&W. This weekend's Summer Excursions will feature locomotive #438! 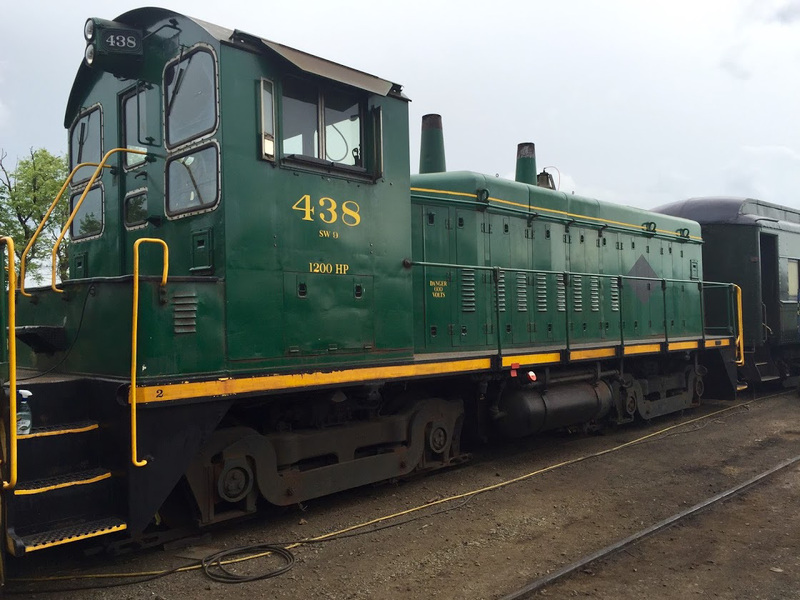 438 is the first locomotive owned by BRRHT, and this will be her first full weekend of excursion service! This diesel-electric SW-9 locomotive was built by GM Electro-Motive in April 1952 and generates 1,200 horsepower. 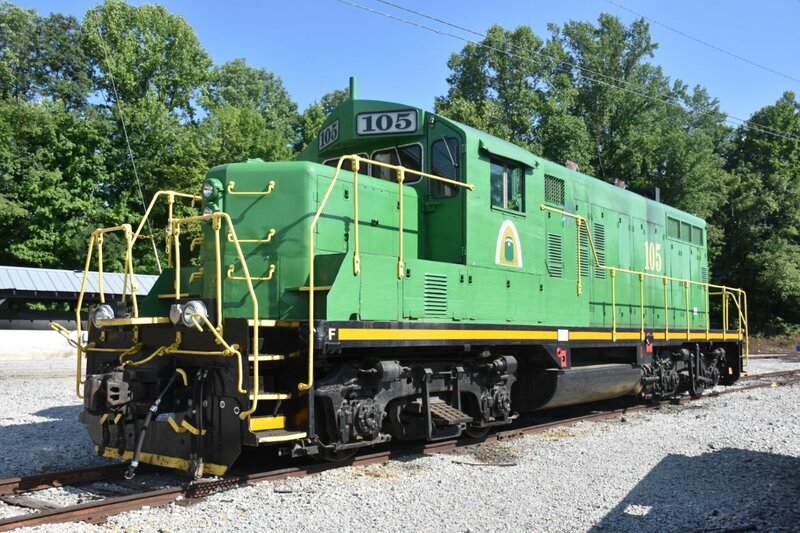 Since acquiring it, BRRHT has made several repairs and improvements to ensure the locomotive is in perfect operating condition for years to come! We need your help! 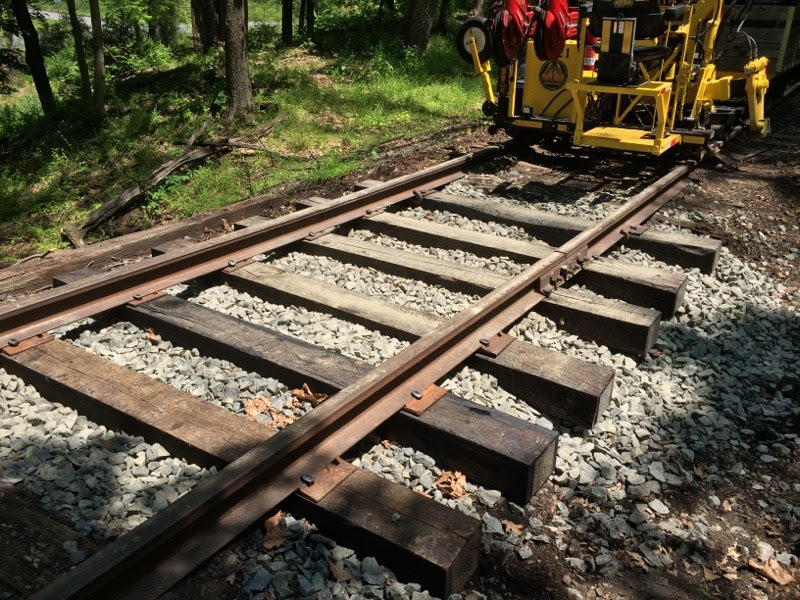 Thanks to the support of our patrons and donors like you, our volunteers have been able to clear almost the entire line from Ringoes to Lambertville, and have rehabilitated over 1 mile of track! The photo above shows some of the results of our first track-work session of 2016 with our rebuilt tie-inserter. With your support we can get further faster and bring the train back to Lambertville! To learn more and donate today, visit us at www.lambertvillerail.com. 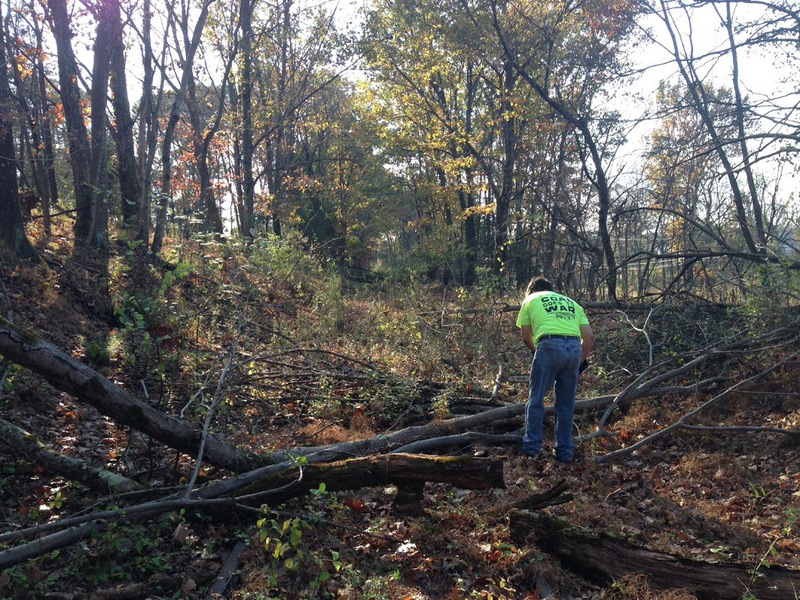 By the way - this is the "before" view of that piece of railroad our volunteers just rebuilt this weekend! It's amazing what they can get done with your help! Our trips leave 2:00 PM 4:00 PM 6:00PM & 8:00 PM on Sat, 2:00PM 4:00PM and 6:00PM on Sunday, 6:00PM & 8:00PM Friday! Feel free to wear your pajamas! All trips will be pulled by our historic antique diesel locomotive #1567 and consists of antique restored passenger cars from the 1950's. Go and see the work these kids are doing. The Metropolitan Division of the Train Collectors Association (METCA) will also be in attendance at the Trainmasters event on both days. JACKSONVILLE, Fla. – June 1, 2016 – Frank Lonegro, CSX Corporation (Nasdaq: CSX) executive vice president and chief financial officer, will address the Deutsche Bank 2016 Global Industrials and Materials Summit in Chicago on Wednesday, June 8, at 8:40 a.m. Central time / 9:40 a.m. Eastern time.